Around 450 of the 500-strong stock has died. 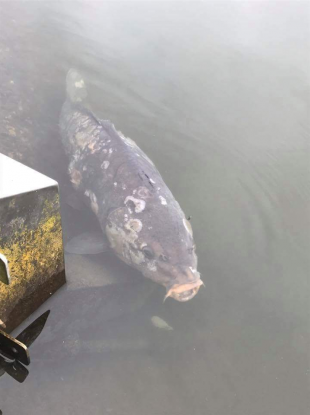 An infected carp in Cork. CONCERNS HAVE BEEN raised after hundreds of carp died in Cork city’s Lough. Around 450 of the 500-strong stock in the urban lake has died of an unidentified disease. Inland Fisheries Ireland (IFI) said that “the cause of death to be a fish health issue with a bacterial or fungal infection suspected of causing the mortalities”. “Anglers are requested to suspend all fishing activity at the lake until further notice. Speaking to RTÉ’s Morning Ireland Sean Long of IFI said that just under 2,000 kilos of fish had been disposed of. He said the mortalities were all carp and that other species weren’t dying off. Speaking to the same show, marine biologist Bill Brazier said that the deaths were noted last weekend. Long added that tests were still ongoing on samples of dead fish to ascertain just what was killing them, but that one suspected disease, Koi Herpes Virus, had been ruled out. Sinn Féin MEP Liadh Ní Riada urged anglers to stay away from the area, urging them to disinfect all equipment so as to not risk spreading the disease. Email “Concern after hundreds of fish die in The Lough in Cork”. Feedback on “Concern after hundreds of fish die in The Lough in Cork”.